The "One Fly" Tying Kit™ - Pink Chenille Worm includes a package of 25 Daiichi hooks, the materials required to tie a lot more than 25 Pink Chenille Worms, and step-by-step instructions. It is probably the least expensive fly tying kit, period. It is one of the easiest flies to tie, period. It is also one of the most effective, exclamation point! The Pink Chenille Worm is a variation of the San Juan Worm. Feel free to call it a San Juan Worm if you wish. I don't because "San Juan Worm" is too broad and covers many colors, lengths and hook sizes. Please note: The Pink Chenille Worm is not the same as the Overhand Worm, which is also made with pink chenille. The Overhand worm is even simpler, requires no tools other than a pair of scissors or nippers, and can be tied as needed on the stream. The Pink Chenille Worms you'll tie with this kit are bright pink, about 1 1/2" long and are tied on a size 20 hook. I think the smaller size, the smaller hook and the bright color of the Pink Chenille Worm are all very important. You know, fly fishermen are a funny lot. More than a few huff and puff and say the San Juan Worm (and surely the Pink Chenille Worm) isn't really a "fly" so they refuse to fish it. I'd like to ask them just what species of fly the Royal Coachman is supposed to represent. I suppose they are probably the same fly fishermen who sniff that tenkara isn't really fly fishing. Who cares if it is or isn't? It's fun and very, very effective. If they don't want to try it, it's their loss, not ours. I, for one, do not care that a worm isn't a fly. I'm happy to fish with a Pink Chenille Worm (or even a real one, for that matter). Regular readers of TenkaraBum.com know that I do not adhere to the "one fly" approach followed by a few Japanese tenkara anglers. However, this pattern tempts me do do just that. I really like this fly. If you think about how Dr. Ishigaki came to choose his "one fly," the Pink Chenille Worm would satisfy all the criteria. He'd lost the last of his favorite flies, went into a fly shop and saw a simple fly. He bought it and found that it worked just as well as his favorite fly did. It had the added advantages of being very easy to tie and using inexpensive materials. You would be very hard pressed to find a fly that works as well as a Pink Chenille Worm, is easier to tie and uses less expensive materials. I am pretty sure that if I asked Dr. Ishigaki to fish with a Pink Chenille Worm, he would just laugh and say "No." However, I will ask you. Tie some Pink Chenille Worms. Don't say "No." Fish with them. I think they will surprise you at how easy they are to tie and how well they work. I no longer offer the Pink Chenille Worm Kit. 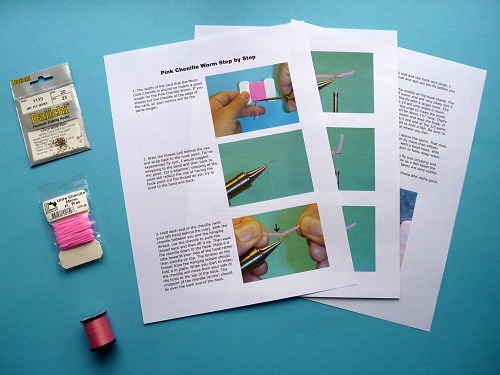 Click the link for instructions for tying the Pink Chenille Worm. I quickly tied a pink SJ worm on a size 20 hook and hit the water. 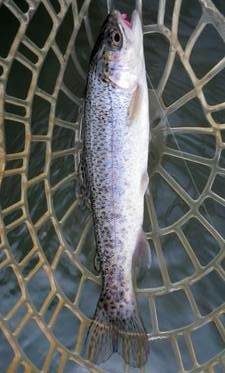 This is my first fish on a tenkara rod.